Fyodor Ivanovich is a doctor who lives with his son, Boris; his daughter, Irina; his mother; and his nephew, Mark. 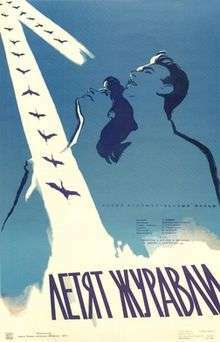 The film centers on Boris's girlfriend, Veronika, during World War II.The character of Veronica represents Soviet women in the context of the aftermath of the aforementioned war. The German blitzkrieg then begins; people take refuge in the subway system underneath the city. During one attack, Veronika's parents refuse to leave their apartment; when Veronika returns, she finds that the building has been bombed. The entire apartment is gone and there is no sign of her parents. 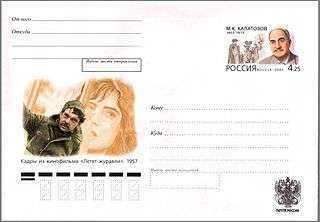 Fyodor Ivanovich invites Veronika to live with his family. Mark, who has been pursuing Veronika, is put in charge of keeping her company to lift her spirits. He is obviously in love with her, but she continually rejects him, waiting for Boris to return. However, during one bombing raid Veronika refuses to go down to the shelter and is left alone with Mark. This scene is unclear, but it appears that Mark rapes Veronika. She is then shamed into marrying him, and the rest of the family believes that she has betrayed Boris. ↑ "Festival de Cannes: The Cranes are Flying". festival-cannes.com. Retrieved 2009-02-10. ↑ Josephine Woll, The Cranes are Flying (London: I. B. Tauris, 2003), 77. ↑ Josephine Woll, Cranes, 77.